Captain America: The First Avenger ably accomplishes its primary mission: serving as the latest – and perhaps last – place setter for Marvel’s long-gestating Avengers ensemble. What is shrewdly surprising about this rockem sockem, old-fashioned origin story of runt-turned-super solider Steve Rogers (Chris Evans, formerly “flaming on” in The Fantastic Four) is that the film tempers the jingoism you’d inherently expect from the chronicles of a super hero named, well, Captain America. 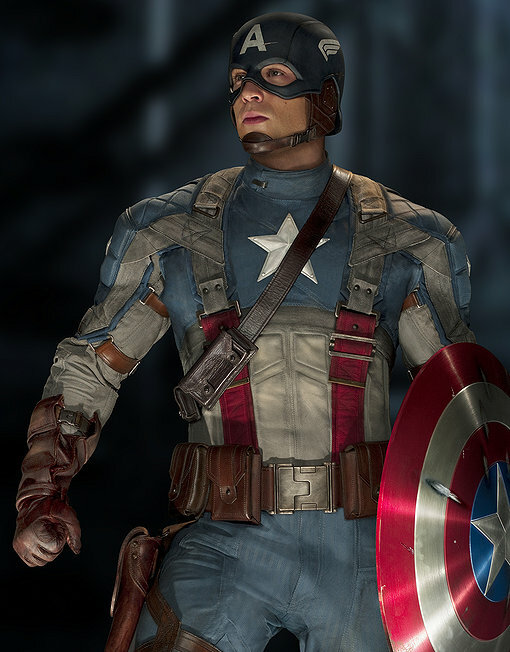 Repeatedly rejected for military induction during World War II because of a menagerie of maladies, bird-chested Steve Rogers is plucked from a life of back alley beatings by Dr. Abraham Erskine (Stanley Tucci), a Bavarian expatriate whose Super Solider serum transforms Rogers into a brawny world-beater. Although patriotic, Rogers’ true mom-and-apple-pie motives are simply beating up bullies and protecting his friends. The clever irony is that the Captain America moniker and image are initially the crude creation of politicians who co-opt Rogers as a travelling War Bond fundraiser. Indeed, the closest Rogers gets to Hitler is punching out his likeness during a garish revue complete with chorus girls crooning a rah-rah show tune called “Star Spangled Man” (composed by Alan Menken), an assignment that re-emasculates Rogers and a scene that’s the film’s unquestioned highpoint. Despite the weighty issues at play, the conflict between Captain America and Red Skull never transcends into a pitched battle between all-powerful adversaries. Essentially, Rogers barges through and takes on Schmidt and his HYDRA minions whenever he pleases. Their obligatory climactic clash is so disjointed it’s hard to tell exactly what happens, aside from Capt. saving the good ‘ole U.S.A. from a bunch of bombs with the names of various American cities written on them. Directed by Joe Johnston, the imagery assumes a dieselpunk quality reminiscent of Sky Captain and the World of Tomorrow. On the other hand, the converted 3D visuals oscillate between useless and graceless. Captain America is enlightening in two respects. First, it again confirms that Tommy Lee Jones makes everything better – he steals every scene he’s in playing a gruff Army colonel (natch). For that matter, amiable performances by Evans, Tucci and Haley Atwell as Rogers’ comely British love interest help paper over more than a few uneven patches. Moreover, it affirms the appeal of an enthusiastic super hero, as opposed to the many born reluctantly from tragedy, orphanage, ego, and accident. Like the masses, Steve Rogers possesses the heart and desire; all he lacks is the ability. True, Chronicles of Narnia screenwriters Christopher Markus and Stephen McFeely minimize any narrative missteps because they take few creative risks. Still, with charm, a little humor, and fists/feet/shield of fury, Captain America is hokey, pulpy fun…no more, no less.